Ellie Cochran is a senior at UA, majoring in Religious Studies and Interdisciplinary Studies with a depth study in Environmental Management. She will be graduating this May and plans to pursue a Master of Science in Family Financial Planning & Counseling. As mentioned in my first blog post, (Just Like) Starting Over Pt. 1, I have spent part of my final semester as an undergraduate sitting in on the Religious Studies honors introductory course (REL 105) that is required of majors. While this course is technically the same introduction material that I received three years ago in my intro class (REL 100), I have noticed some distinguishable differences between the honors and non-honors courses. At the University of Alabama, honors courses are offered by each department to count towards an Honors College designation. The courses offered are typically very similar to non-honors courses in their material, but they primarily differ in class size; non-honors introductory class sizes hover anywhere between 80 to 200 students, while honors courses typically cap out at around 30. As an Ambassador for the College of Arts & Sciences, I am often meeting with prospective high school students and their parents to discuss the College, give tours, and answer questions about life at UA. Many times, while meeting with these students, another ambassador and I will share details about the variety of opportunities and involvement options that are offered on our campus – the Honors College being one of them. While in these meetings, I have heard numerous ambassadors who are part of the Honors College characterize their experience and they never fail to highlight one fundamental quality – smaller class sizes. Because I have never taken honors courses at UA, I have not had the opportunity to experience the supposed differences between an honors and a general intro course. Now, thanks to Prof. Emily Crews’ class, I have experienced both – I am now an “insider” in both a typical, large enrollment introductory course as well as a small honors course. Throughout the semester though, and as I mentioned in my first post, there was not a major change in the material that was taught; I could still refer to my old class notes. The class was taught from the same book, Prof. Russell McCutcheon’s Studying Religion: An Introduction, and aside from minute variations that mostly developed from differing teaching styles, the courses are predominantly the same in terms of content. The class form, on the other hand, was radically different. This spring, in the honors course, I have been able to revisit the same topics which perplexed me and led me to the department where I would quickly declare my major. The difference, however, is that this time around, I was privy to incredibly impressive, curious, and challenging conversations that would not be possible without dedicated student engagement. While such striking conversations could have just as easily occurred in my introductory course (or even more striking, given the 100-plus students in the room), the form of the class dictated the result. That is, the number of students and the design of the classroom (yes, the attached swivel chair/desk combo) is immensely influential in how the course will play out. And while Prof. Simmons and Prof. Crews may have been teaching from the same book, what they could each do with the students, how they could profess, and how they could facilitate student interaction in the class was, ultimately, a product of setting. 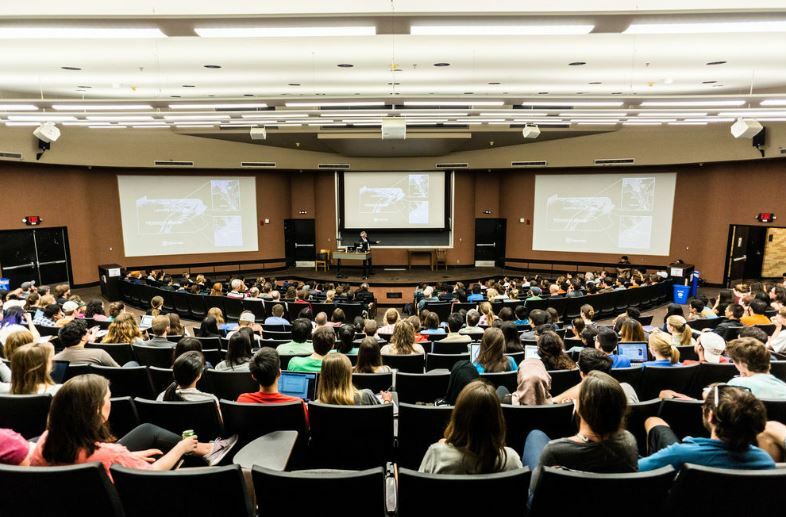 Although large enrollment lectures are commonplace for core introductory courses at a large, public institution like UA, there actually are some noticeable distinctions. Those ambassadors were right all along. In Prof. Crews’ class specifically, many exercises that she has had the students participate in would not have been possible in my lecture class. It would have also been much more difficult for every student to participate in discussion in my REL 100 course. As a result, I do think that the students were not only more engaged with Prof. Crews, but with each other, unknowingly forming bonds and relationships through their persistent sharing on such intimate topics. With more overall involvement and energy in the room, Prof. Crews is then equipped to give more precise, personal feedback to each student. Whether “better academic results are achieved,” may be up to the individual, but from where I am sitting, the class discussions on typically controversial subjects were definitely enhanced. I thoroughly enjoy hearing what every student has to contribute. A student in any given class has no idea that there is such a difference as a result of the seemingly inconsequential setting of the class. Only through the comparison of now experiencing both do I have the ability to see such contrasts. So, while content may have been almost identical in the honors and non-honors introductory courses, the form ultimately decides some of the student’s experience. This entry was posted in Faculty Blog, Relevance of Humanities, Religion in Culture, Student Blog and tagged Content, Form, graduating seniors, Introduction to Religious Studies, Prof. Crews, Prof. Simmons, REL 100, REL 105, REL seniors, REL Undergrads, Spring 2019 by Ellie Cochran. Bookmark the permalink.